The goal of the Demon Gate design was to stand juxtapose the generic black, red, white, & yellow combinations that we commonly see in rashguards. Pink and teal are not commonly used in martial arts. Probably because we all want to feel like we are the toughest ufc fightas eva. And, if you really ponder it for some time, what can possibly be more evil than pink and teal? If good is synonymous with peaceful earth tone colors, it stand to reason that, in contrast, evil is synonymous with obtrusive unnatural colors. Right? Well, if you disagree it don’t matter because I’m writing this and you are not. HA! I really liked that the NoGi ensemble came in a little bag much like a lot of higher end Gi companies are doing. It’s the little things that make relationships work, and that is no different when it comes to a business/consumer relationship. 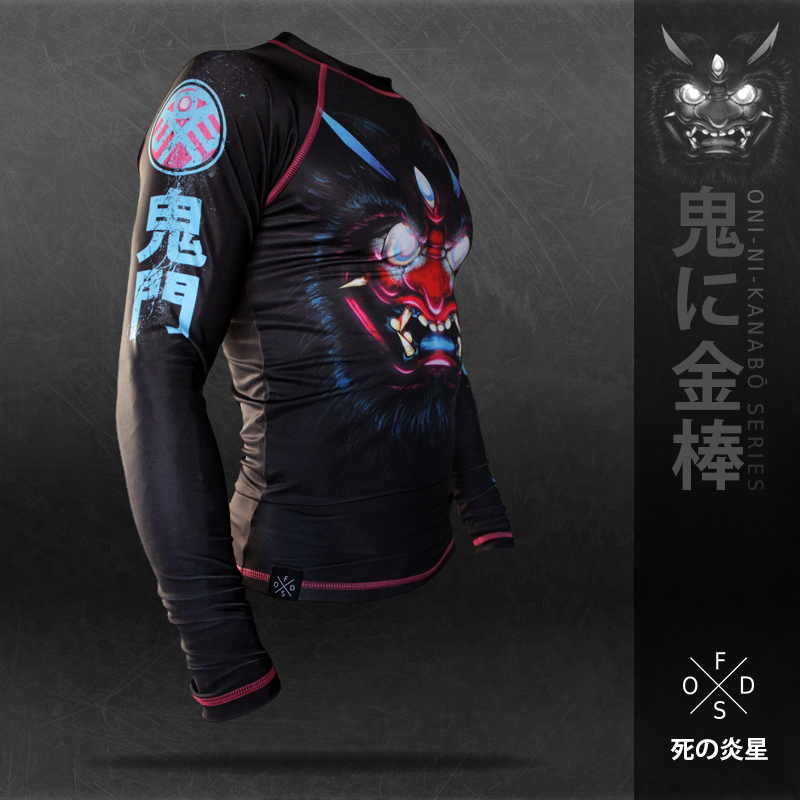 The rash guard design is pretty damn bold. I like that they incorporated some colors that are not traditional to martial art clothing, with some hybrid concepts. For example, the dragon has been synonymous with martial arts since I was a child, but a demon not so much. Yet they make the connection that martial arts are weaved in Japanese culture and they adopt the Japanese Oni mask as an avatar for the inner combative spirit of a martial artist. I can appreciate that. I am a light featherweight and therefore ordered the small. I walk around fluctuating in the 140lbs range depending on my activity level and adherence to healthy eating. I am about 5’9″ on a good day (read 5′ 7″). This thing fit like a glove with plenty of sleeve length but not excessive amounts either. I particularly dislike when rashguards aren’t long enough to cover your torso when grappling. If I wanted to show everyone my amazing abdominal development, I’d be taking a picture in the mirror. It’s a good thing that PeelGi got it right in that regard. The unique color palette features pink contrast stitching against the black material. PeelGi used a teal color to bring the kanji on the sleeves to life matching the demon’s horns and mouth. This design makes an immediate statement. Everyone noticed the design and had something to say about it. Admittedly, if you are a minimalist type of person, this design may not be for you as was the case for some of my training partners. However, the bulk of the feedback was positive and enthusiastic. Perhaps a little too enthusiastic lol. I had a lot of people asking me who made it, and how they can get their hands on one. I told them they’d have to wait for the review to come out to get the 411 (mostly because I’m a jerk). I used the ensemble for a while before I sat down to do this review because I wanted to wash it several times before I commented on the build quality. I usually expect a nogi ensemble to have some fraying of the edges and some stitching to become undone or unruly after putting it through several stress tests. Although the Demon Gate appeared to have a standard build quality, it has held up very well against months of rolling and washing. I wash my nogi stuff the same way I wash my black gis, because it has ensured that they stay fresh smelling. The PeelGi Demon Gate did not have one edge frayed or one stitch undone. Kind of impressive. If the appeal of the designs mesh with your personality, I would encourage you to purchase a PeelGi NoGi ensemble. The designs are top notch, and supporting small businesses is a good deed. Furthermore, it forces the bigger more commercial companies to keep up with design concepts and stay competitive. I like the customer service that PeelGi provides, and I think you would too. To get yours, go to the PeelGi website. Dang that is a slick rashguard- glad to hear about the no-rollup, that’s the biggest pet peeve that comes along with rashguards. Thanks for dropping by, Nate. Yes, I HATE when that happens. What size are you, by the way? You’re the first to comment and could get a coupon if you’re interested. I’m a medium, and I’d love a coupon! Thanks! Awesome, Nate, make sure you’re an insider that way you’ll be entered in the drawing! Will contact via social media. This is badass. I saw that 10th planet guy wear it for his UFC debut. I was wondering who the heck made it. I like how the shorts match the rashguard. size L if I’m not too late. Oss! You aren’t too late Ryan! Just make sure you’re on the insider list and you’ll be entered to win!